A set of four full cast stories, with an extra CD of behind the scenes interviews. 1.1 The Bloodless Soldier (Written by Justin Richards and featuring Alex Lowe, John Banks, Robin Bowerman and Alex Mallinson). A group of soldiers return from overseas service, but they have brought a terrible evil back with them. 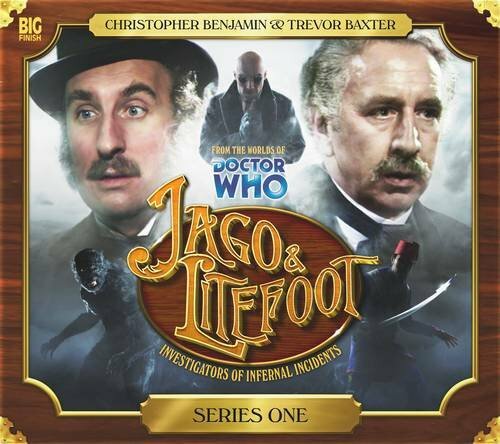 Sergeant Quick calls for assistance, and Jago and Litefoot are soon on the trail of the Bloodless Soldier...1.2 The Bellova Devil. Written by Alan Barnes and featuring Stephen Thorne, Duncan Wisbey and Alex Mallinson). A body is found on the Circle Line, wearing full dress uniform. It is Reginald Colville, a man certified dead six weeks ago! Thus begins a chain of events that pits Jago and Litefoot against the mysterious machinations of the Far-Off Travellers Club...1.3 The Spirit Trap (Written by Jonathan Morris and featuring Janet Henfrey and Lex Shrapnel). Ellie Higson believes that Mrs Vanguard can hear the voices of the dead, but Henry Gordon Jago thinks it is all theatrical trickery. But if Vanguard is a harmless fake, then why have some of those who have attended her seances disappeared mysteriously? 1.4 The Similarity Engine (Written by Andy Lane). When Jago takes a tumble on an unseasonably icy road, he ends up in hospital. The fiendish scheme of Dr Tulp is drawing to a cataclysmic climax. The Similarity Engine is operational, and a new, improved model of mahogany murderers have been unleashed...CAST: Christopher Benjamin (Henry Gordon Jago), Trevor Baxter (Professor Litefoot)Lisa Bowerman (Ellie), Conrad Asquith (Sergeant Quick), Toby Longworth (Doctor Tulp), Alex Lowe (Private Michaels), Robin Bowerman (Corporal Lorton), John Banks (Private Higson/Hari Sunil/Captain Hertford/Constable Lee), Alex Mallinson (Private Smith/The Manchester Mangler/Alf), Duncan Wisbey (Doctor Sacker/Bulgar), Stephen Thorne (The Club Secretary), Peter Silverleaf (Reginald Colvile/Resurrection Joe), Janet Henfrey (Mrs Vanguard), Lex Shrapnel (Toby), John Ainsworth (The Landlord), Matt Steer (Smitty), Alex Lowe (Sergeant Lange Ragamuffin).